My best mate when I was a little kid was Patrick McGinness. 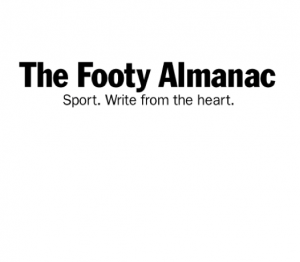 Pat McGinness – a good Warrnambool name. Like Kelly, Murphy, Quinlan, Lenehan, Mugavin, O’Toole, Flaherty and O’Shea. Tough clan names, worn casually, on shop windows, in the classroom, and Monday morning footy results page. South West Victoria, with its conservatism and tribalism, is the furtherest outpost of the Irish empire. But Pat looks anything but Irish. His mum is Italian, and has passed down her olive skin and dark hair and eyes. Pat lived a few doors up on Aitkens Road. We shared life’s first adventures under blue and grey skies across the road in the paddocks of Victoria Park, with the water tower looming over us like a space ship. Pat was the loyal sidekick from Saturday afternoon matinee movies, always first over the top into the Indian camp. He was brave, daring and fearless. After we moved west to Fitzroy Road, Pat and I would meet halfway on our bikes at the Lennon Avenue milk bar and claim the refund from empty soft drink bottles we had collected around the neighbourhood. He slept over weekends and came on our Sunday afternoon drives to Thunder Point. We jumped the fence at The Show and got kicked off the dodgem cars. And sat front row at the Capitol Theatre for the premiere of Can’t Stop the Music. We stood at dad’s hip as the Grand Annual thundered by below. We were Blighty and Cabes, as long nights fell across the backyard. We stuttered. He lost his; I kept mine. Pat moved east out near the race course, to Monash Avenue. We saw less of each other, but still had Saturday afternoons at the roller skating rink. Around this time, Mum saw a notice from Pat’s father in the Classifieds declaring he took no responsibility for debts incurred in his name. Mum said this meant Pat’s parents had separated. He never mentioned it; I didn’t ask. Pat was still Pat: funny, up for anything. He stopped playing footy on Saturday mornings. He said he didn’t want to anymore, but Mum quietly told me it was because Pat’s mum couldn’t afford boots, so I was not to hassle about it. Mum offered to buy a pair, but she declined. That was when I first learnt not all people lived the same life I did. My sisters and I are fortunate. We come from workers: butchers and sheep farmers. Both parents were present and reliable. We had three meals on the table, new clothes, good education, boundaries, role models – everything children need to grow up straight. I was the first kid in our class to have a VCR. Pat introduced me to Bruce Springsteen in the garage at Monash Avenue. We couldn’t have been older than 12 and 13. The River had been out for a while; Pat sang it word for word – slowly, deliberately. I giggled when Mary got pregnant, but found the Boss’s mournful ballad of disappointment and loss of hope, dark, almost frightening. I didn’t understand hardship; I still don’t. Not deep, in your bones, entrenched hardship. I couldn’t relate to the tough times Bruce spoke of, but Pat sang The River like an anthem. He was telling me his story. Bruce’s tales of cars, back roads and tough kids resonated with Pat. He went to the high school; I went to CBC, the boys’ Catholic school. It was the mid-80s, Warrnambool was still quietly segregated by class, race and religion. We tried to hang on to the friendship, but it grew too difficult. I had my mates, he had his. High school kids had their parties and section of the beach; CBC had theirs. I finished school, went to uni in Melbourne, travelled overseas; Pat worked the family farm out at Framlingham, married, had kids. We bumped into each other occasionally, but things had changed; we weren’t kids anymore. But we grow, we change, we stay the same. I last saw Pat a few summers ago at Lake Pertobe. Eloise played with his kids on the swings, metres from where we had our photo taken as boys in our mop hair and long-sleeved North Melbourne jumpers. This time, conversation was easy, and a disquiet I had long carried about us fell silent, replaced with relief. A circle felt complete. The overkill of Born in the USA turned me off Springsteen for a long time, but Blood Brothers, a story reliving childhood friendship, brought me back. At the outdoor concert last February, The River silenced everything and the audience sunk back into their seats and let it flow over them. I thought of Pat and that day in the garage. Great stuff Andrew. Growing apart but Growing all the same. Childhood recollections are important milestones in our existence. A connexion to The Kangaroos of yesteryear is one that will never be eroded. Eloquent. Moving. Like you I could never get over the triumphal sounding (not the meaning) of Born in the USA. And Bruce got popular. Not good for us sulking aficionados. Now it is probably my favourite album, but I always skip the first track. The River – winding the windows down on the yellow TC Cortina and screaming out the existential cry of Hungry Heart. Who was that man/boy? Thanks for this Starkers…touching, moving, wonderful paced. “That was when I first learnt not all people lived the same life I did”. Our childhoods are a collection of first-time realisations, life lessons. This line beautifully sums up an important epiphany. The harmonica on the original is probably the saddest sound in rock and roll. Like you, I wouldn’t have a clue about that proper working class desperation, but I know people, family too, who have it. I think a lot of went off Bruce after Nebraska. I flirted with Tunnel of Love, really loved the double albums from 92 that nobody else did (Barcelona Olympics and resource security legislation! ), but haven’t really bothered with anything since, or gone to another live gig… too busy with PJ Harvey and stuff. But every now and then I sneak the laptop out the back and cry along to Stolen Car. Jump the fence to Jackson Code. Imagine the Ramones doing Hungry Heart, as intended. Love reading these childhood reminiscences particularily those related to music. Music is the lynchpin to so many memories, and although we are all different, we are so much the same. Thanks for sharing your memories Andrew, I really enjoyed the read. Starkers, that’s a lovely piece. The River really has something for just about everyone. Sprawling. Great visuals and story Andrew.